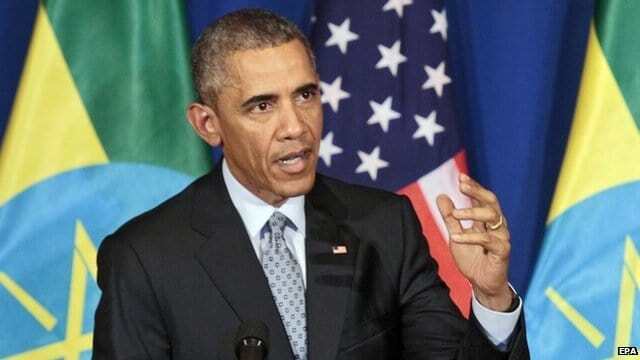 As the first sitting U.S. president to address the African Union in Addis Ababa, Ethiopia, President Barack Obama (pictured) warned members that they are holding the continent back when they refuse to respect presidential term limits, reports the BBC. Not mincing words, President Obama specifically called out the recent “re-election” of Burundian President Pierre Nkurunziza who successfully added his name to the infamous list of African dictators who have extended their constitution’s term limits in time for elections. One university student, who admitted that he was afraid to be seen agreeing with the President, said, “I was looking around and I was wondering, Should I clap?” It felt good, he added. But term limits were just the tip of the iceberg for President Obama. He also insisted that “the cancer of corruption” was eating away at the creation of much-needed jobs, schools, and hospitals on the continent.